This hidden gem may be the early antidote to all your holiday shopping headaches. Here you will discover Irish-themed gifts and “uniquely Dublin” artwork by area artists. Discover jewelry creations by Dublin artists Cathy Smith Gresham (seed-beaded mini-purses), Susan Bringardner (pieces featuring Czech and Swarovski crystals combined with natural stones, minerals, freshwater pearls and vintage beads) and Carolyn Pigman (sterling silver bracelets and earrings). Check out the hand-thrown stoneware pottery by Tim Frederich, Historic Dublin scenic notecards, suncatchers, journals, pocket charms and much more. Know an Irish rock fan? Pick up a temporary armband tattoo. 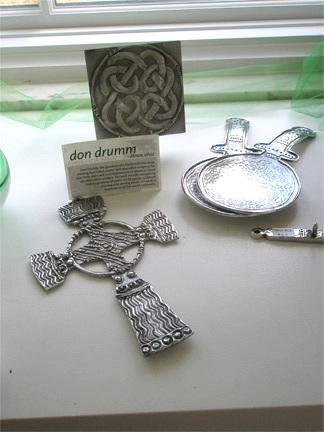 Buying for someone who appreciates Celtic traditions? How about an embossed leather-crafted journal or pewter measuring spoons? Stopping by the Celtic Corner brings with it the added bonus of visiting the fabulous home of the Dublin Arts Council. Built in 1941, this historic French-eclectic style home is now on the National Register of Historic Places. The castle-like structure (which puts one in mind of an Irish estate) is an architectural masterpiece. It was the longtime home of Eleanor Gelpi—a committed champion of the arts in Columbus who served as a founding member of the Greater Columbus Arts Council, among other organizations. 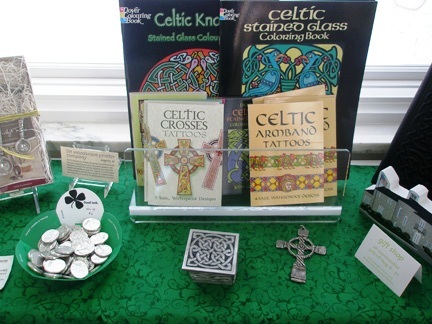 Visit the Dublin Arts Council Gift Shop (and the Celtic Corner) during these hours: Tues. 10 a.m.- 7 p.m.; Wed.-Fri., 10 a.m.- 5 p.m.; Sat., 11 a.m. -2 p.m.